This company was founded in 1992. It offers half-day, three quarter and full day charters. If you want to have multi-day trips, the company will arrange that also. Blue fin offers both offshore and inshore trips. The rates of the trips are from $460 to $900. The rate depends on which type of boat you take and how lengthy your trip is and also on the area you chose. Blue fin maintains a fleet of three first class boats which are fully equipped with the latest in sonar, fishing equipment and controls. The team of captains and first mates of Bluefin I, Bluefin II, and Bluefin III, have extensive knowledge of Conventional and Fly Fishing and Catch & Release Sportfishing. This company is connected with the preservation of Billfish in Costa Rica through the Billfish Foundation of Fort Lauderdale, Florida. It is also involved with other animal and environmental preservation efforts in Quepos and Manuel Antonio.Blue Fin try to keep the environment clean by recycling all engine oil and y using diesel fuel that doesn’t contain lead. 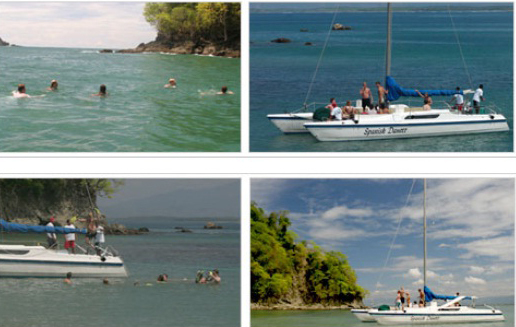 If you are interested go for a Sunset sail tour then you will be able to explore the beauty of Manuel Antonio. The adventure will start as you sail down the scenic coast, past the beautiful islands and beaches of Manuel Antonio National Park. As the boat proceed you will be able to see dolphins swimming in the boat’s bow wake. If you are lucky enough you might also see occasional whales, abundance of sea birds and giant sea turtles. On the boat you will meet professional crews who will ensure your safety and comfort and also will guide you through this aquatic paradise. You will be served delicious food and drinks by the crews. When you will take your meal you will feel a homemade touch on those food though they have tradition of the great cruise ships. You will also have cooled beer, soft drinks, long drinks. During the sunset the boat will stop in a scenic jungle bay where you can swim or snorkel in the refreshing, calm water. You will have to take only a towel, swim suit and a good sun-protection creme as the other snorkel equipments will be provided by the boat. In this sun set sail trip after taking your dinner you will get the opportunity to see one of the often-spectacular sunsets. There s no doubt that you will have a romantic and memorable trip in paradise. If you want to have a honeymoon nights on sea or private charter for spending some solitary time in your favorite place then don’t hesitate to ask as the BlueFin is all in your service.